When you die, the way in which your property is handled will depend on the type of documents (or lack thereof) you’ve set up before your death. The following is a summary of the ways your property transfers to heirs when you pass away. Life Insurance. At death, life insurance proceeds are passed to your beneficiaries (and in most cases, tax free). For example, if you have a life insurance policy with a face amount of $500,000, when you die, your beneficiaries receive the $500,000 face amount tax free. When you purchase life insurance, you name your beneficiary or beneficiaries – those who receive the death benefit when you die. Most married couples will name each other as beneficiaries on their respective polices, some will name charities, and other will name other relatives, individuals, or trusts. Life insurance contracts generally avoid probate (the legal process of validating a will and division of property), unless you name your estate beneficiary (a bad idea) or fail to name a beneficiary (also a bad idea). Annuities. At death annuities operate the same way as life insurance regarding beneficiaries. A big difference however, is the tax treatment. Even though an annuity may pay a death benefit, in most cases it is taxable to the beneficiary. This is different from life insurance death benefits that are received tax free. Any taxable annuity death benefits are taxed as ordinary income. Trusts. Trusts can be established either during your lifetime or at your death. They may also be revocable (changeable) or irrevocable (not changeable). Trusts are set up by a grantor (the person wanting the trust) and assets are placed in the trust, managed by a trustee, for the benefit of the trust beneficiary. When you die, the assets in the trust are still managed by the trustee for the benefit of the beneficiary. Like annuities and life insurance, trusts avoid probate. Brokerage Accounts. When you have a brokerage account where you hold stocks, bonds, mutual funds, or ETFs it’s called a non-qualified brokerage account. The non-qualified means that it’s not a 401(k) or IRA. When you open this type of account, you are given the option to name a beneficiary on the account should you die. At death, the property passes to the beneficiary. The beneficiary also receives special tax treatment on the account. Brokerage accounts also avoid probate. Retirement plans. When you have retirement plans such as 401(k)s and IRAs you also name beneficiaries who get the account assets when you die. The tax treatment of the assets will depend on the account (Roth or not), and what the beneficiary chooses to do with the assets (sell them all or take minimum distributions). Brokerage accounts avoid probate. Wills. A will is a written legal document that directs how and to whom your assets are dispersed after your death. Wills also name a guardian(s) for minor children should both parents die. Wills also name an executor for your estate that helps direct where assets go, what assets to sell, and filing the final tax return for the deceased and or the estate. As mentioned before, probate is the process of validating a will. Thus, it’s a public process, and often long and expensive. Additionally, the documents mentioned above supersede the language in a will. In other words, if your will states that your kids get your IRA assets at your death, but your IRA beneficiary is another person or entity, the IRA overrides the language in the will. Dying without a will means dying intestate. Dying intestate means that the state determines how your assets are divided, who gets them, and if you have minor children, who becomes their guardian. Different states have different laws, but be assured, the laws may differ from what your intentions are or who you think should get your assets or be guardians. Don’t risk it. If you don’t have a will, or your beneficiaries named, consider taking care of this today. An extremely important point not to be overlooked is the need to update your beneficiaries or documents whenever you have a life changing event. Life changes mean births, deaths, divorces, job changes, etc. For example, if you get divorced and remarry, and forget to change your beneficiary from your ex-spouse to your new spouse – and you die – your ex-spouse is still the beneficiary and gets the property. It is paramount to update your accounts, estate documents, insurance policies, and retirement plans to reflect any life changes. The post How Property Transfers At Death appeared first on Getting Your Financial Ducks In A Row. Quality and Min Vol: whats the difference? Following Decemberâs heightened market volatilityâand with ongoing geopolitical uncertainty, trade wars and slowing global growthâmy recent conversations with clients have resoundingly focused on how to build more resilience into their portfolios. Proper positioning for a market slowdown or significant bouts of volatility is something that can keep even the most experienced investor up at night. Investors have frequently turned to Quality and Minimum Volatility strategies for just this type of resilience. We have seen evidence of this trend in flows into iShares Edge MSCI USA Quality Factor ETF (QUAL) and iShares Edge MSCI Min Vol USA ETF (USMV). Year to date through February 28, 2019, flows into QUAL and USMV totaled $1.8B and $2.6B respectively. These flows followed combined inflows into the two funds of $7.2B in 2018. Itâs easy to see why investors are turning to these strategies. Both factors have tended to outperform in the later stages of the economic cycle â performing best at the peak of the cycle or at the beginning of an economic slowdown, as the chart below shows. We can go even deeper by analyzing monthly market returns over the last four years, both for the whole period and across different gradations of returns. In down markets, the Quality factor and the Minimum Volatility factor have outperformed the broader market 71% and 79% of the time, respectively. Importantly, for both factors the likelihood of out-performance increased as the market return declined. While both strategies have provided investors with out-performance in periods of market decline, it is important to notice the more subtle differences in factor behavior particularly when the market returns are more extreme. As the chart shows, when the market declined more than 2%, the Minimum Volatility factor was more likely to outperform. In contrast, when the broad market was trending and rose more than 2%, the Quality factor was more likely to outperform. Another way to look at resilience is through upside and downside capture, how much each factor participated in positive and negative environments, respectively. Not surprisingly, during the full period observed, the Quality factor provided investors with higher upside potential, but at the expense of a higher downside capture. In contrast, the Minimum Volatility factor provided much lower downside capture but sacrificed some upside potential. Interested in Minimum Volatility strategies? Read more about it. Quality strategies seek enhanced returns versus the market through exposure to profitable companies with less debt and more stable earnings. Since the Quality factor has historically delivered more upside capture with less downside resilience, it may be more appropriate for risk-aware, return seeking investors. Minimum Volatility strategies aim to create a holistic portfolio with lower risk than the market. The factor has historically delivered lower downside capture, but lower upside potential as well, making it more appropriate for investors seeking to reduce risk while still maintaining potential for returns similar to the broader market. 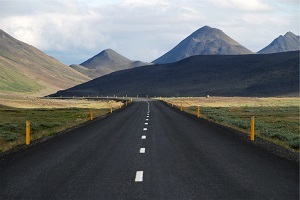 Investors looking to structure more resilient portfolios in the face of the uncertain market environment ahead may be well-served to incorporate both Quality and Minimum Volatility strategies. Holly Framsted, CFA, is the Head of US Factor ETFs within BlackRockâs ETF and Index Investment Group and is a regular contributor to The Blog. Elizabeth Turner, Vice President and Christopher, Associate are members of the Factor ETF team and contributed to this post. Chinaâs local-currency bond market is opening up to global investors. The Bloomberg Barclays Global Aggregate Index begins including yuan-denominated bonds this month, automatically adding exposure to such bonds for index investors. We favor maintaining such passive exposure and preparing to invest more. The inclusion of local-currency government and policy bank securities into the global bond market benchmark index is set to gradually occur over a 20-month period. Those passively invested in that index will, by default, add Chinese bond exposure to their holdings â which we view as a positive. Local-currency Chinese bonds are set to make up roughly 6% of the global fixed income benchmark when the phase-in is complete. At that stage, Chinaâs yuan currency will be the fourth-largest component in the index, behind the U.S. dollar, euro and Japanese yen. The chart above shows one reason we advocate investors maintain the inclusion exposure: Local-currency Chinese bond yields this decade have been materially higher than the average yields of the developed market bonds that make up the majority of the global bond index. See the top line in the chart above. We see China becoming a growth turnaround story this year, as policy makers ease fiscal and monetary policies and market fears of a U.S.-China trade war dissipate (see our Q2 Global investment outlook). Improvements in the domestic economy should result in rising yields and a stable or appreciating yuan currency. Christian Carrillo of BlackRockâs Asia Pacific fixed income team sees the higher yields of Chinese bonds creating a tactical opportunity to add additional exposure in the future. His team estimates the fair value yield of 10-year Chinese government bonds will rise slightly in the second half amid positive economic data surprises and stabilizing inflation, but actual yields may rise more. Chinese bond prices may decline a bit as yields rise, but investors maintaining exposure stand to benefit from both relatively high income and potential currency gains. Chinaâs bond market has been dominated by domestic investors, and offers diversification benefits as a result. The correlation between Chinese bond and U.S. Treasury prices has been close to zero over the past five years. This benefit may diminish over time as foreign investorsâ ownership share of the market increases. What are the other risks and challenges? We believe investors who hedge their currency exposure should take a patient approach toward Chinese bonds, as hedging costs currently are significant. This could improve over time as affordable hedging instruments become available. Liquidity is also a concern, particularly for investors with shorter-term horizons. The domestic Chinese investor traditionally has had a âbuy and holdâ approach to investing. As more foreign investors gain access to this market and trading begins between onshore and offshore players, liquidity should improve. Chinaâs bond market is the worldâs third-largest, with about $13 trillion in outstanding bonds. We believe the marketâs size, attractive yields and diversification benefits mean it cannot be ignored, similar to our view on Chinaâs domestic equity market. We see Chinaâs inclusion in global bond benchmarks as a key event. Understanding the market is key. We believe maintaining automatic exposures and preparing to invest more is a very good place to start. Scott Thiel is BlackRockâs chief fixed income strategist, and a member of the BlackRock Investment Institute. He is a regular contributor to The Blog. In an effort to âreduce, reuse and recycle,â I have switched from disposable coffee cups to an amazing stainless-steel tumbler that keeps my drinks hot or cold for hours. Just as importantly, I have finally trained my brain to remember to bring it to work with me. Like cutting down on coffee cup usage, adding sustainable investments to a portfolio takes a bit of preparation. Fortunately, itâs almost as easy to put into action. One way that is growing in popularity is the use exchange traded funds (ETFs) that seek to track environmental, social and governance (ESG) indexes. ESG data providers collect information on companies and rate them with an ESG score. Index providers use these scores as the basis to determine which securities are included in an index and may apply negative screens to exclude certain sectors such as weapons manufacturers or tobacco companies. While people often associate ESG or sustainable investing with stock funds, a similar approach can be used for bond portfolios, too. As with stocks, bond issuers can be rated on distinct ESG characteristics and in turn, the bonds from these issuers. Indeed, ESG analysis has become increasingly important in credit ratings themselves. As demand has grown, credit ratings agencies have been exploring ways to incorporate ESG analysis in their ratings, and some have already started doing so. Letâs look at two approaches to investing in more sustainable bond issuers: ESG and green bonds. Itâs important to note that when data providers such as MSCI rate companies, they do so based on ESG characteristics that are most relevant to their industry. For instance, an issuerâs environmental impact would be more important for an oil company, while a bank would be more closely judged on the social impact of its lending practices. The creators of ESG bond indexes take these ratings into consideration to determine whether or not these companies make it into the index and at what weighting. Depending on the construction of the index, other factors are used to seek a certain target, such as a similar risk and return profile as the relevant broad market benchmark. For example, guidelines can be set so that the ESG index adheres to certain sector weightings, credit ratings and duration targets. Screens on a companyâs business involvements like tobacco and weapons can also be applied, in addition to companies that experience a severe ESG controversy (e.g. a massive oil spill or product recall). A broad ESG approach that seeks a similar risk and return profile as the relevant broad market benchmark allows investors to use these funds as portfolio building blocksâmuch as they would a traditional bond ETF. Green bonds are an even more targeted approach to investing sustainably and are often known as âimpactâ investments, since proceeds proactively and directly fund sustainable projects. These bondsâissued by foreign government agencies, supranational issuers or corporationsâare used to fund new and existing projects that promote environmental purposes. Think solar panels or clean transportation. While there is no governing body that determines whether an issue is âgreen,â the Green Bond Principles are voluntary process guidelines that encourage transparency and disclosure and promote integrity of the green bond market. Itâs important for investors to ask how these issues are being evaluated and for reporting that details the impact from the use of the bondâs proceeds. A green bond ETF makes it easy for investors to gain diversified exposures to these projects. iShares ESG USD Corporate Bond ETF (SUSC)âHolds corporate bonds with maturities of greater than or equal to one year. iShares ESG 1-5 Year USD Corporate Bond ETF (SUSB)âHolds corporate bonds with maturities of 1 to 5 years. iShares Global Green Bond ETF (BGRN)âSeeks to track the Bloomberg Barclays MSCI Global Green Bond Select (USD Hedged) Index. Karen Schenone, CFA, is a Fixed Income Product Strategist within BlackRockâs Global Fixed Income Group and a regular contributor to The Blog. Investing in the Real World Not a Backtest! On this date fifteen years ago, April 19, 2004, this blog was officially launched. The article below was the first post ever, and I’ve reposted it here in celebration of the 15 year anniversary of Financial Ducks In A Row. I have not edited the content below, it’s exactly the same as it was originally posted back in 2004. A lot has changed over the years, and I continue to enjoy sharing sound financial principles, information and advice through this medium, and I hope to keep it up for a long time into the future. 1. See a lawyer and make a Will. If you have a Will make sure it is current and valid in your home state. Make sure that you and your spouse have reviewed each other’s Will – ensuring that both of your wishes will be carried out. Provide for guardianship of minor children, and education and maintenance trusts. 2. Pay off your credit cards. Forty percent of Americans carry an account balance – not good. Create a systematic plan to pay down balances. Don’t fall into the “0% balance transfer game” as it will hurt your FICO score. Credit scores matter not only to credit card companies but to insurance companies as well; you can avoid an unpleasant increase in your insurance rates by managing your credit wisely. 3. Buy term life insurance equal to 6-8 times your annual income. Most consumers don’t need a permanent policy (such as whole life or universal life). Also consider purchasing disability insurance; think of it as “paycheck insurance.” Stay-at-home spouses need life insurance, too! Note: Each family’s needs are different. Some families have a need for other kinds of life insurance, so you should review your situation carefully with an insurance professional or two before making decisions in this area. 4. Build a 3 to 6 month emergency fund. Establish a home equity line of credit before you need it – this can take the place of part of your emergency fund. 5. Don’t count on social security! Fund your IRA each and every year. If you don’t fund it annually, you lose the opportunity. Fund a Roth IRA over a traditional IRA if you qualify. 6. If offered, contribute to your 401(k), 403(b) or other employer-sponsored saving plan. Use your company’s flex spending plan to leverage tax advantages. If you don’t use your flex plan or fund your retirement plan annually, you lose the opportunity – and the tax advantages – for that year. 7. Buy a home if you can afford it. Maintain it properly. Build equity in your property. You’ll have much more to show for your money spent than a box full of rental receipts! 8. Use broad market stock index funds and direct purchase government bonds to reduce risk, minimize costs and diversify your portfolio. If you have limited options, for example in your 401(k) plan, make sure that you diversify across a broad spectrum of options. Don’t over-weight in any one security, especially your employer’s stock – remember ENRON? If you are unsure about your financial affairs or you have financial goals such as retirement planning, college funding, business succession or estate planning that you’d like help achieving, call Blankenship Financial Planning at 217/488-6473 to schedule a no-cost, no-obligation “Get Acquainted” meeting to discuss your situation. 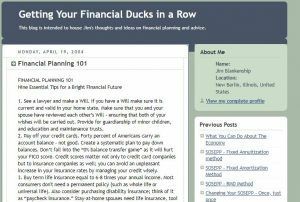 The post Celebrating 15 years: Financial Planning 101 appeared first on Getting Your Financial Ducks In A Row.